A metal cutting machine (referred to as a machine tool) that processes various metal workpieces by cutting, grinding or special machining methods to obtain the required geometry, dimensional accuracy and surface quality of the machine (except hand-held). It is a wide-ranging and wide-ranging equipment. Its structural characteristics, processing accuracy, automation, working conditions and environmental conditions are very different. There are different requirements for the lubrication system and the lubricant used. 1. The main components in the machine tool are mostly mechanical parts, standardized and generalized, and the degree of serialization is high. For example, sliding bearings, rolling bearings, gears, worm gear pairs, rolling and sliding guides, screw drive pairs (screw nut pairs), clutches, hydraulic systems, cams, etc., have different lubrication conditions. 2, the use of machine tools Environmental conditions: machine tools are usually installed in indoor environment, the summer ambient temperature is up to 40 Â° C, when the winter temperature is below 0 Â° C, more heating, so that the ambient temperature is higher than 5-10 Â° C. High-precision machine tools require a constant temperature air conditioning environment, generally around 20 Â°C. However, due to the high precision and automation of many machine tools, the requirements for viscosity, oxidation resistance (life) and oil cleanliness of lubricating oil are strict. 3. Working condition of machine tools: Different types of machine tools of different specifications and sizes, even on the same machine type, the working conditions are very different due to the different processing parts. The requirements for lubrication vary. For example, the grinding wheel spindle bearings of high-speed internal grinding machines and the heavy-duty, low-speed spindle bearings of heavy-duty machine tools have very different requirements for lubrication methods and lubricants. The former requires lubrication with an oil mist or oil/gas lubrication system, using a lower viscosity lubricant, while the latter requires lubrication with an oil bath or a pressure cycle lubrication system, using a higher viscosity oil. 4. Adaptability of lubricating oils and lubricating coolants, rubber seals, paint materials, etc. : Lubricating coolants are used on most machine tools. In lubricating oils, oils are often emulsified and deteriorated due to the mixing of coolant. The parts are rusted, etc., causing the rubber seal to expand and deform, causing the surface of the part to paint bubbles and peel off. Therefore, the compatibility of oil and lubricating coolant, rubber seals, paint materials, and oil leakage prevention are considered. In particular, as the degree of automation of machine tools has increased, lubricating/cooling general-purpose oils have been used on some automation and CNC machine tools, both as lubricating oils and as lubricating coolants. Second, the use of machine tool lubricants: due to the variety of metal cutting machine tools, structural and component conditions have changed a lot, it is difficult to provide a clear opinion on the selection of lubricants for its main components, the following content is based on the relevant standards of some machine tools Recommendations for lubricants for the proper application of the main components for reference when selecting lubricants. 1. Recommended lubricants for machine tools: full loss system: refined mineral oil, L-AN32, L-AN68 or L-AN220, used for light-duty parts, often using HL hydraulic oil. 2, gear (closed gear): continuous lubrication (splash, circulation or jet), refined mineral oil, and improve its antioxidant, corrosion resistance (ferrous and non-ferrous metals) and anti-foaming, CKB32, CKB68 or CKB100 , CKB150, closed gears with light load and small operation (related to headstock bearings, cutter boxes, carriages, etc. ), CKB32 and CKB68 can also be used for mechanical control of clutch overflow lubrication, CKB68 can replace AN68. HL hydraulic oil is used in the box; refined mineral oil, and its anti-oxidation, corrosion resistance (black and non-ferrous metals), anti-foaming, extreme pressure and anti-wear properties, CKC100, CKC150, CKC200, CKC320, CKC460, Any type of closed gear (except hypoid gears) and associated bearings that operate at normal or medium constant temperatures and under heavy loads can also be used for manual and centralized lubrication of lead screws, feed screws and light duty rails. 3, spindle, bearing and clutch: spindle, bearing and clutch, refined mineral oil, additives to improve its resistance and corrosion and oxygen resistance, FC2, FC5, FC10, FC22, sliding bearings or rolling bearings and related clutch pressure, oil Bath and oil mist lubrication, in the case of a clutch system, due to the risk of corrosion, it is required to use products without anti-wear and extreme pressure agents; spindles, bearings, refined mineral oil, and additives to improve their corrosion resistance , anti-oxidation and anti-wear properties, FD2, FD5, FD10, FD22, sliding bearing or rolling bearing pressure, oil bath and oil mist lubrication, can also be used for components requiring oil viscosity, such as precision machinery, hydraulic or hydraulic Lubrication of pneumatic machinery, solenoid valves, oil lubricators and hydrostatic bearings. 4. Guide rail: exquisite mineral oil, and improve its lubricity and stick-slip property, G68, G100, G150, G220, used for lubrication of sliding bearings and guide rails, especially suitable for low-speed motion rail lubrication, so that the guide rails are â€œcrawlingâ€ "The phenomenon is reduced to a minimum, and it can also be used for lubrication of various sliding parts such as screw, feed screw, cam, ratchet and light duty worm gear for intermittent operation. 5, hydraulic system: hydraulic system, refined mineral oil, and improve its anti-rust, anti-oxidation and anti-foaming, HL32, HL46, HL68; refined mineral oil, and improve its anti-rust, anti-oxidation, anti-wear and anti-foam , HM15, HM32, HM46, HM68, general hydraulic system including heavy-duty components, also suitable for lubrication of sliding bearings, rolling bearings and all kinds of normal loads and gears (except worm gears and hypoid gears), HM32 and HM68 Replacing CKB32 and CKB68 respectively; exquisite mineral oil, and improving its anti-rust, anti-oxidation, viscosity temperature and anti-foaming properties, HV22, HV32, HV46, CNC machine tools, in some cases, HV oil can replace HM oil. Hydraulic and rail system, refined mineral oil, and improved rust, oxygen, anti-wear, anti-foam and stick-slip, HG32, HG68, used in sliding bearings, hydraulic rail lubrication systems to reduce the rail at low speed The "crawling" phenomenon of the lower movement, if the viscosity of the oil is suitable, can also be used for a separate rail system, HG68 can replace G68. 5, the use of grease: general grease, and improve its resistance to oxygen and corrosion, XBA or XEB1, XEB2, XEB3, ordinary rolling bearings, open gear and various parts requiring fatliquoring. Note: code description: AN - full loss system oil, CKB - anti-oxidation, anti-rust industrial gear oil, CKC - medium load industrial gear oil, FC - bearing oil, FD - FC bearing oil to improve wear resistance, G - Rail oil, HL hydraulic oil, HM hydraulic oil (anti-wear type), HV low temperature hydraulic oil, HG-hydraulic-rail oil, XBA - anti-oxidation and anti-rust grease, XEB - anti-oxidation, anti-rust and anti-wear grease . Fits for Kia series. Mainly for 11Sportage R, 18Sportage R, Sportage, 13Sorento, New Carens, KX3, KX5, KX7. Made from high quality material, retractable and structural reinforcement form for long durability. 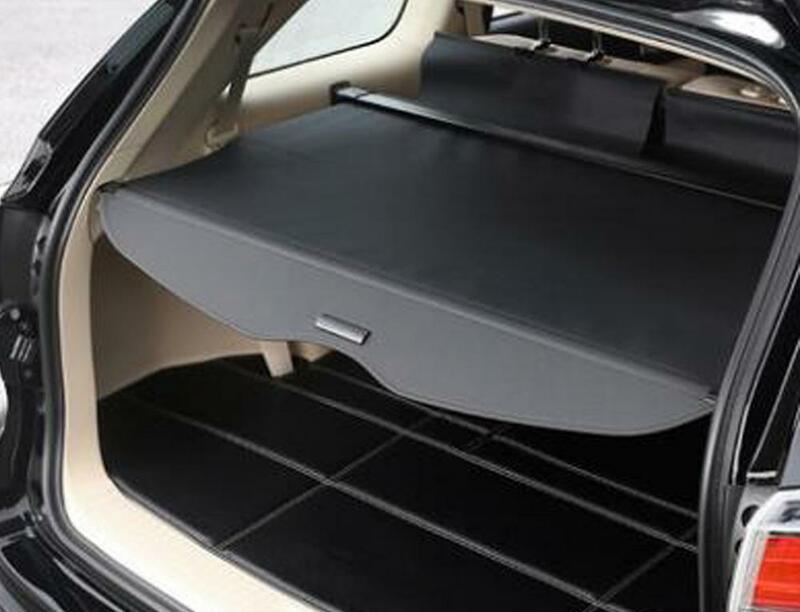 Protecting your goods under the Cargo Cover from thieves, complete cargo privacy and security. Heavy-constructed support rod, hold your goods steady without dropping. Easy to install: retractable for easy cargo access and removal.